Today I’d like to share with you another Bible lesson that you can use with your family or youth group. This one was a ton of fun to write (and to do) because it involves one of our favorite objects for Biblical applications . . . a PLUNGER! Curious about how you can use a Plunger to portray spiritual principles? Let’s PLUNGE right into the lesson! 1. Have a plunger relay race. Divide into teams and give each team at least two plungers and a water filled balloon or ball. The object of the game is to get the ball from one end of the line to the other by passing it from plunger to plunger. If the ball falls to the ground, the team has to start over. The first team to get their ball to the end wins. When the game is over, say: Playing a game with plungers can seem kind of strange! Plungers are, well, a bit disgusting to think about! We should not LOVE a plunger! Guess what? Our love for things in this world should be like our love for PLUNGERS when compared with our love for God! We should love God so much that everything else is like a PLUNGER in comparison! 2. Have a “Plunger Ball” toss. Every child needs a partner, a plunger, and a ball. Have them line up facing their partners. They have to toss a ball back and forth, catching it and tossing it with the plungers. Have them keep moving further from each other until they miss the ball. The team that stands the furthest from each other and still catches the ball wins the game. Use the same application as in activity 2. When the game is over, say: In this rather silly game, you wanted to get the roll of toilet paper into the toilet and you had to do it on your knees with a toilet bowl cleaner. James 4:6 says, “God is opposed to the proud but gives grace to the humble”. When I think of a humble person, I think of a person who is willing to get down on their hands and knees and clean a toilet! True humility involves doing those things that others refuse to do. Our love for God needs to be so strong that we are willing to do ANYTHING for Him! Read James 4:4-6. Ask: When you think of God being a jealous God, what do you think of? Discuss. Usually, we think of jealousy as a bad thing. In fact, we have studied jealousy and the terrible consequences that can come as a result of jealousy in a person’s life. However, God describes Himself as being jealous . . . . for US! In other words, God does not want to share our love with any other thing. He wants us to love Him more than ANYTHING at all! We have a decision to make. Will we serve the Lord and love Him more than anyone or anything else, or will we love the world and the things of the world more than God? When you have finished, say: Those were all some things that we often place in front of our relationship with God. We say that those things are more important and we let those things control us instead of our love for God. This is not the way it should be. Instead, our relationship with God needs to be the ABSOLUTE most important thing in our lives. How are you doing in this area? Is there anything in your life that is more important than God? Are you in danger of loving the world? What does loving the world say about our relationship with God? Where do all the things of the world come from? What is happening to all the things of the world? What is the only thing that will last? Say: All the things of the world are passing away. The only thing that will last is our relationship with God. When all is said and done, the only thing that will matter is what we did with Jesus Christ. Take a plunger and hold it up. Ask: What are some things in this world that we get attached to? What are we in danger of putting ahead of God? As kids mention items, use a sharpie to write them on the plunger. When the plunger is full, say: This plunger is full of “things of the world”. Those things might look great for awhile, but eventually, they will pass away. At some point, I will use this plunger, and all of those things will go in the toilet! Our love for God needs to be more important than any of this stuff! God’s love for us is strong and never-ending. He loves us so much that He died for us! That’s worth a whole lot more than a plunger, isn’t it? Give everyone a plain piece of paper and markers, crayons, etc. Have each child draw or write what they think of when they think of God’s love for them. Play a song for them while they do this – their time is up when the song is finished. Encourage them to do this without talking and away from others. This is meant to be a time between them and God. When the song is over, close this time in prayer, thanking God for His incredible love for us. 1. Make plunger art. Why not? If you used the plungers earlier, get them out again and encourage the kids to use these to make an art project. They can trace them or dip them in paint and paint with them . . . provide the art supplies and let the kids provide the creativity. There might be a lot of laughter at this time – but the message will be remembered! 2. Make and decorate heart sugar cookies as a reminder that we need to love God more than anything else. 3. Help your kids make a “Jesus Loves Me” craft. 4. Sing “J is for Jesus”. I hope you enjoyed this lesson! It is taken from a study that I wrote for families and other groups over the book of James. We used it at our church this year with all of our different aged groups. (For this lesson, the most fun was with the high schoolers. Giving a bunch of high school boys a plunger led to quite a bit of fun!) Anyway, there are 35 lessons in it and you can find more information about it here. 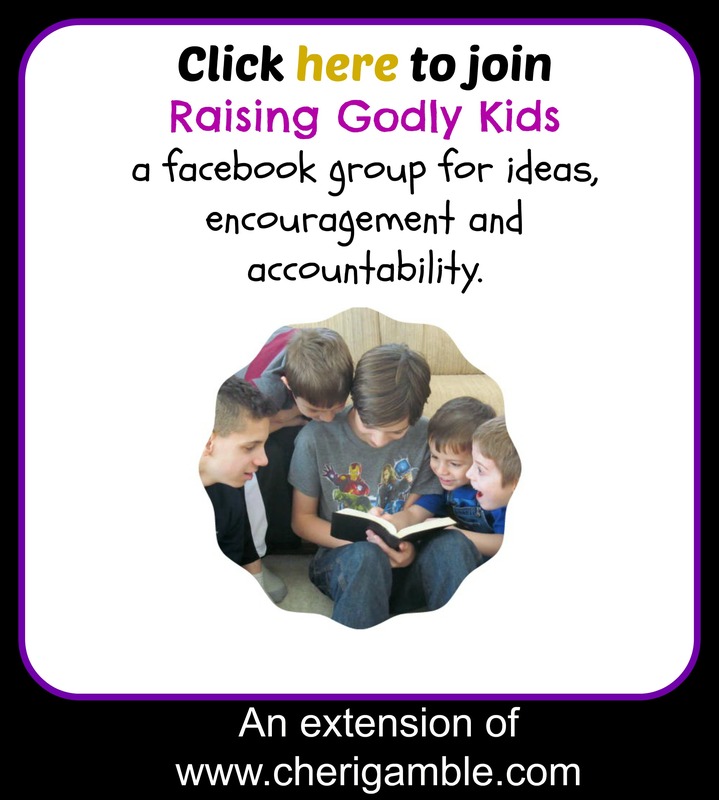 The entire group study is adapted from my homeschool curriculum, so if you homeschool and are looking for a Bible curriculum, check it out! You can find it both on amazon and as a pdf. Thanks for stopping by at Ministry Mom! Have a great day and keep raising your children for Jesus!